When: The program is offered Monday thru Thursday with A.M. and P.M. at both sites Transportation is provided. 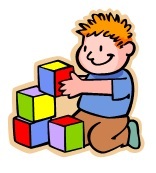 What: A wide variety of activities designed to help children reach their full potential. Speech – correct sounds pulling words together to express thought, listening and following directions. Learning – colors, numbers, alphabet, days of week, months of year. Motor – coloring cutting, running skipping, jumping. Personal / Social – group activities, making friends, sharing, turn taking. Adaptive – using restroom, pouring activities, eating with the group, buttons, zippers and shoe lacing. To Whom: Children who have been to a Child Find Clinic, who may have a delay in their development… which is determined by a developmental assessment. With Whom: Should your child qualify, he/she would have the opportunity to learn and interact with other children his/her age. Through Whom: The Doniphan County Education Cooperative sponsoring Doniphan County’s three school districts. Because the sea is so wide and our boat is so small… Working together to make your child’s entrance into school a positive experience for all.